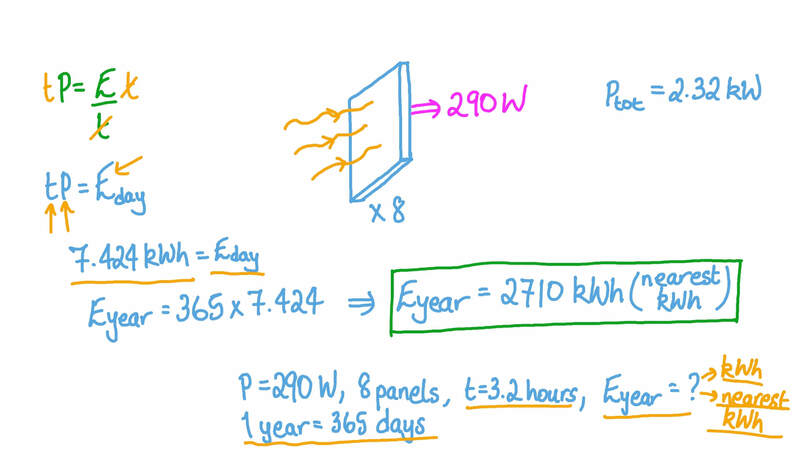 In this lesson, we will learn how to describe the advantages and disadvantages of photovoltaic cells, and how to calculate the total energy output of solar panels. A manufacturer makes a type of solar panel that has a power output of 290 W when exposed to direct sunlight. 8 of these solar panels are fitted to the roof of a house, which receives an average of 3.2 hours of direct sunlight per day over the course of a year. What is the total energy output of the solar panels on this house over the course of a year? Assume that there are 365 days in a year. Give your answer in kilowatt-hours to the nearest kilowatt-hour. There are 5 200 houses in a town. The amount of electricity supplied to those houses every year is 1 . 9 7 6 × 1 0  kWh. A manufacturer makes a type of solar panel that has a power output of 330 W when exposed to direct sunlight. The average number of hours of direct sunlight per day over the course of a year in the town is 2.8 hours. How many solar panels have to be fitted to the roof of each house in order to supply the entire town with the amount of electricity it needs for the year? Assume that each house must be fitted with the same number of solar panels and that energy consumption of the town is constant throughout the year. Use a value of 365 for the number of days in a year. A manufacturer makes a type of solar panel that has a power output of 300 W when exposed to direct sunlight. On a day in summer, 1 of these solar panels is placed in direct sunlight for 6 hours. What is the total energy output of the solar panel over these 6 hours? Give your answer in kilojoules. Longyangxia Dam is a hydroelectric dam of the Yellow River in Qinghai province, China. Next to the dam is one of the world’s largest solar farms, with 9 km2 of photovoltaic cells. The output of the hydroelectric generators in Longyangxia Dam and the output of the photovoltaic cells is coupled. When the power output of the photovoltaic cells is low, more water can be allowed to flow through the dam. This increases the power output of the dam, and so the total power output can be kept constant. Which of the following correctly describe the advantages of this system? Both the photovoltaic cells and the hydroelectric generators produce direct current, which can easily be combined to produce a higher-current output of the power station. The power station uses less water than if it were a fully hydroelectric power station. The power station can provide both direct current power and alternating current power to China’s electric power transmission network. The photovoltaic cells can be used as a backup power supply when the water level of the dam is low. The power station can continue to generate power at night when there is no sunlight. The Amundsen–Scott South Pole Station is an Antarctic research station located at the South Pole. During the Antarctic winter, the research station gets power from several generators that run off JP-8 jet fuel. Which of the following best explains why solar panels are not suitable for power generation during the Antarctic winter? ADuring the Antarctic winter, the South Pole receives no sunlight for several months; thus solar panels would be useless. BSolar panels stop working below 0 ∘ C ; thus they are useless at the South Pole, where temperatures are rarely above − 2 0 ∘ C .
CSolar panels are unreliable and require frequent maintenance, which is impractical in temperatures that are often below − 2 0 ∘ C .
DBlizzards at the South Pole would cover the solar panels in snow; thus blocking any sunlight from reaching them. The solar panels would have to be continually cleared of snow, which is impractical. Agadez Weather Station is a weather station in the Sahara desert in Niger. Which of the following correctly explain the advantages of using solar panels and a battery to power the weather station? The Sahara has very little cloud cover; thus a lot of sunlight would fall on the solar panels, producing a high electrical power output. The efficiency of solar panels increases with temperature; thus solar panels are ideal for locations that have high daytime temperatures. The Sahara is very large; thus weather stations in the Sahara are very remote. It would be very expensive to connect the weather station to the electrical power grid of any country around the Sahara. Solar panels require very little maintenance; thus they are ideal for remote locations. Photovoltaic cells are often used to power satellites. Which of the following are reasons why photovoltaic cells are chosen as the power source for satellites? Photovoltaic cells do not require a solid or liquid fuel that needs to be resupplied in order to keep generating energy. Photovoltaic cells require very little maintenance. Photovoltaic cells provide direct current, which is what most electrical systems need to work. Photovoltaic cells provide alternating current, which is what most electrical systems need to work. Photovoltaic cells have always been very cheap to manufacture. There are no clouds in space to block the sunlight that the photovoltaic cells need. What type of current do photovoltaic cells generate?